The time is coming upon us. Tis the season to be Jolly Fa-la-la-la-la La-la-la-la! Don’t you just love this season?! I do! There is so much crafting to be done!! You can crochet gifts, ornaments, decorations, etc. The list never ends. Today, I am sharing a pattern that a dear friend of mine posted on my personal facebook page. The picture caught my attention. She did not say anything in the post. Just the picture with the link to the free pattern below it. It looks easy and its absolutely free. I think that they make beautiful gifts, as well as decorations. Go get the pattern, whip one up, and let me know what you think. 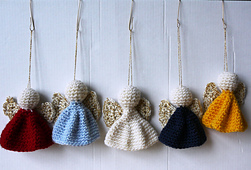 Have you made any crochet Christmas ornaments? This entry was posted in Christmas, The Tennessee Stitch: Daniele Dyer and tagged Christmas, Crochet, Danielle Dyer, Free Pattern, Pattern, The Crochet Crowd, The Tennessee Stitch: Daniele Dyer. Bookmark the permalink.